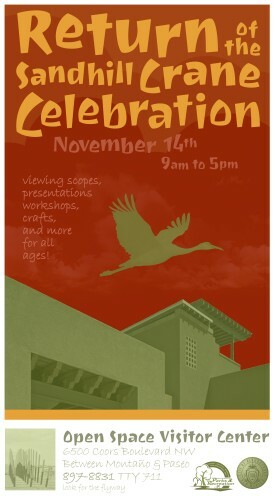 2015 Return of the Sandhill Crane Celebration /Hawks Aloft Inc.
On Saturday, November 14th, you can visit Hawks Aloft staff, volunteers, and a few of our Avian Ambassadors at the 2015 Return of the Sandhill Crane Celebration at Albuquerque’s Open Space Visitors Center (6500 Coors NW). Now in its 8th year, this festival is one-day only welcome back to the city’s wintering Sandhill Crane populations. Hawks Aloft will be tabling for the entire length of the event, which will be held from 9am to 5pm. In addition to the opportunity to view wildlife, the event will include speakers, presentations, and nature walks that contextualize winter migration for visitors, as well as screenings of local films and musicals like Love in the Bosque. Vendors will have handcrafted wares for sale and the music of locals Bethany and Quinn Boyack will accompany you while you shop. You can even learn some tai chi or practice your origami skills! Many Sandhill Cranes winter in the Middle Rio Grande Valley, foraging for seeds, roots, bugs, and worms during the day in open fields and at night making their way to the shallow sandbars of the river. Reaching heights of more than five feet and achieving lifespans of nearly 20 years, these graceful birds are always memorable and impressive to behold. Honoring the Sandhill Crane and other birds on their winter migratory path is a great way to mark the changing of the seasons and acknowledge the intelligence and beauty of the natural world. Please join us at this year’s Return of the Sandhill Crane Celebration.